DataSift’s new Historics service promises to mine the Twitter archives going back two years for insights that could guide business decisions on future strategies. With an estimated 250 million tweets posted daily, Twitter is a huge trove of data about things as mundane as celebrity wardrobe malfunctions or as weighty as rebellions in the Middle East. What some have called the “Twitter firehose” — DataSift says there were 250 billion tweets in 2010 — can be an invaluable information source, provided the right data can be found and filtered. That’s what DataSift brings to the table. The company will say more about that other gold mine of information — Facebook — and how it can tap into that in a few weeks, a spokeswoman said. DataSift’s current service handles only very recent tweets. Gnip, the only other company Twitter has authorized to work with its data, can go back 30 days; DataSift Historics will dial back to Jan. 2010. While some might question how valuable months- or years-old information really is, DataSift CEO Rob Bailey said companies planning new products, promotions or price changes would do well to study the impact of their past actions before proceeding and that Twitter is the perfect venue for that. “Companies spend a lot of money designing new products and social network reaction can be a huge accelerant or a countervailing force,” he said. A phone maker working on a new model would be well served to go back to see what customers thought of its last release — what they liked and didn’t like about the screen size, resolution and features, for example. If a price change is under consideration, a smart company might go back to see how past price actions were positioned and received. In addition, it is helpful for businesses to know which Twitter users have the most influence and followers and to study their tweets carefully. Bailey said DataSift works closely with Twitter to make sure the data is handled properly. “Users are extremely sensitive to privacy so we spent four to five months checking out the data . . . if people have deleted tweets, we make sure they stay deleted,” Bailey said. 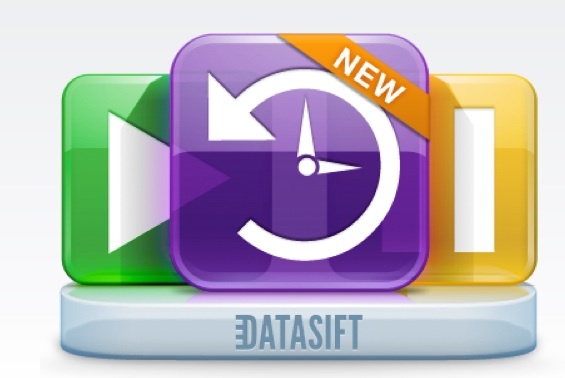 DataSift Historics will be broadly available in April.